well, I don't understand the reason for it, but I just sold one of these in the bazaar on Xegony/Druzzilro for 48900 plat. Others asking about 50k. After 3 months of camping this item (only 10-12 total spawns of the named after 100s of clearings), I just got wavecrasher to drop back to back within 5 min or less of each other. The named is rare spawn and the wavecrasher is still uncommon or rare. My mini paladin is good to go now. Good luck. Buyer Beware! Deceptive pricing now that it drops again. I am now seeing traders selling Wavecrasher for 250k in order to swindle someone who thinks it "No Longer Drops." Camp it yourself! This weapon is back in game on all servers, it drops off of Shimmering Sea Spirit in Siren's Grotto. This is once again available on all servers as a drop from the Shimmering Sea Spirit. Placeholders are a watery servant and an icy servant. There are 20 spawn points. Available once again on all servers. Trader name is Mocor Send tell. Thanks. Traded my Plagued Skull Fragment LoN card for one of these and 1.3 million pp. Yeah, it's still a nice item to have if you can get your hands on one. Even if you do come across something better like Willsapper, this is tradeable and usable by all melee classes with 1hs skill. For those that can't get ahold of something better, there is a weapon not mentioned yet on this page that has the same effect. Vyledorinajirnak the Sea's Justice was added to a siren temptress' drop table after Siren's Grotto was revamped and Wavecrasher stopped dropping. Although this new weapon is only usable by WAR PAL SHD BER, leaving rogues looking for a Locustlure and forcing Rangers to do their epic 1.0 for Earthcaller (both of which slow for more than this) while Bards are wondering why they bothered since their songs are more effective. Warriors always have the option of hunting down a Truncheon of Doom too I suppose. pretty sure this doesn't drop, camped for 2 days ..nada. yeah, this item is long gone after they revamped SG. you might get lucky and find one on a trader but i wouldn't hold my breath. camped zone for 3 hrs, killed whole zone, and didnt c a single elemental up, is it confirmed the wavecrasher no longer drops?? This thing no longer drops. No more elementals. Its been going for several hundred kpp now. Just wondering if anyone has had this drop lately. I notice all the posts are a couple years old. I was actually able to obtain one of these, after two years of waiting. It's the only weapon in game that I know of that procs slow and is sk usable, unless I'm mistaken. I had to trade a Amulet of Necropotence for it http://everquest.allakhazam.com/db/item.html?item=1143 and might I say it was well worth the wait. It procs alot for my 70 sk who has 150 aa's. It's the only weapon in game that I know of that procs slow and is sk usable, unless I'm mistaken. Slows for a higher percentage than Wavecrasher but is not tradeable unless you're on FV, so you'd have to farm your own. Just got this tonight on Al'Kabor. Dropped off A Watery Servant. I'm thrilled =D. This thing is hella fast. Yeah Thy, since they added those required lvl's to weapon proc's, this puppy won't proc now till 40 - kind of a drag. Also, since Siren's has been re-vamped I'm guessing that this item no longer drops since the mob that used to drop it no longer exists in SG. Has anyone seen this weapon drop since the re-vamp of sirens? This fine weapon didn't process the other night in Kedge Keep for our 37 warrior. Any idea what level is needed to get this puppy to proc? As of the Mar 23 patch, does not proc for my 33 Warrior. Not sure what level you need now. i was wondering which of the two, wavecrasher or CHoS, was better for tanking and aggro purposes? No More Shimmering Sea Spirits? RE: No More Shimmering Sea Spirits? I could honestly not answer this. I camped mine months pre-patch. Took only 3 hours to get. Was well worth it. I use it even still now that i havea ToD the slow is abit useless. Its still a great item to carry around. I agree that this is a good aggro weapon. 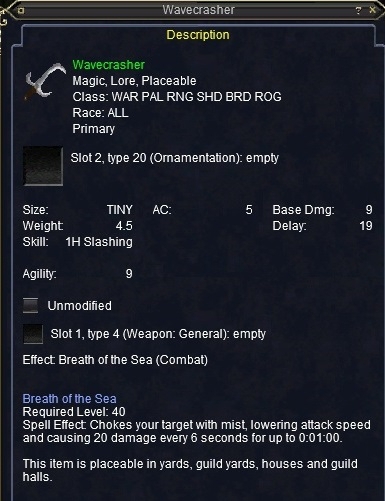 I had bagged it for a while when I got CHoS and SotB from droga, but now we are doing a lot of LDoN dungeons and I broke out the 'ol wavecrasher again. It's very nice as a lot of times we have a chanter but no shaman ( add more dps ) and the chanter is so busy mezzing and MLing that the slow proc really saves cleric a lot of mana over time. Also a lot of times we kill so fast in LDoN that it's almost a waste of mana for every mob to be slowed. I love my wavecrasher and I'm glad I didn't sell it...also comes in handy for things such as trials, or any event where waves of mobs are coming quick. I want to get a BoC also, but even if I do I'm still gonna bag this weapon for the right occasions. The only way I'm getting rid of it is if I get a willsapper ( 35% slow instead of 20%). Us warriors don't get spells, so we need our bag of tricks, no?